That's it. Back to earth Monday after a nice time visiting other planets for the last few weeks. Return marked in suitably fitting manner by glimpses of the dark side of the moon and a total eclipse during an impromptu party last night. Finally got those pens and pencils tidied up. Now, where can I hide them? Bryony collects stationery. I shouldn't complain because it's probably more sociably acceptable than my collection of stamps at the age of 12. But I did manage to put my items in albums, and there was some order about them in that what came in sets tended to stay in sets. And they were all more or less in lines. After the 12th consecutive request for a new pencil case in what seems like the same number of days since she'd had one, and even being quite taken myself at the idea of 12 pens for 34p in Tescos resulting in my donating several packets to the cause, I did begin to wonder where they all went. I mean she had these bulging pencil cases but several years' worth of easy-to-wrap presents never seemed to see the light of day again. Now I know she writes a lot, and I mean a lot, but most of that's on MSN these days which doesn't need anything inky or sparkly. So where did they all go? Under the bed, in drawers, on top of the wardrobe, in fact anywhere that had not been previously occupied in her room. If she hadn't started thinking about clothes and needed space for what I hope won't prove a similarly vast collection then they may well still be there. While she's away on holiday I thought I'd be kind and sort them all out for her. Well, that was sometime in July. Here I am now, with single digit numbers of days until I return to nine-to-fivery, with one massive box of pens, pencils, crayons, gel pens, highlighters, felt tips, brush tips and metallic shades. I feel she should apologise to IKEA. There must have been 20 of their small pencils. The rest, though, someone has bought for her and are mostly working so I've done the first bit - sorting them into types. Now the fun starts as I try to make up the sets again. If it's sunny tomorrow that's where I'll be, on the yellow chair with neat little bundles and several cups of coffee, quite content. I can't imagine where she got that trait from . 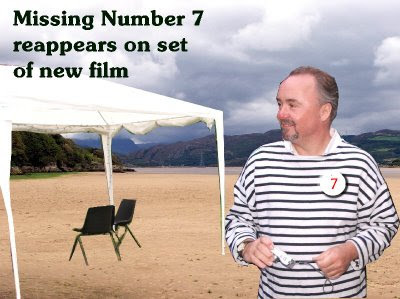 . .
Never actually shown in the 1960s series, presumably because he was only 2 then, Number 7 was spotted recently on location. The first guests arrive and head straight for the drink! A couple of new additions arrived recently. Love the coffee! Interesting to have a change of location too. Postmarks on the envelopes this time: Birmingham and Oxford. Seems like the sender's travels do take them away sometimes from 3* hotels. Sorry, I've just checked and Scia on martin looks rather smart, a 4* near Milan.